This article originally appeared in the 18th Annual Tri-State Pottery Festival, 1985 Plate Turner's Handbook, June 13, 14, 15, 1985. 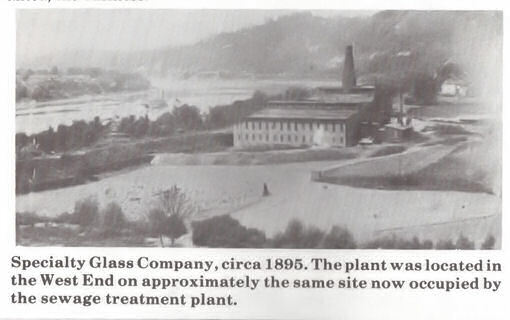 Although East Liverpool has always been known as a pottery town, it was once the home of a glass company. In April 1882 the contracts were awarded and work began on the construction of a glass plant. By the end of April the Cleveland and Pittsburgh Railroad was providing a rail connection to the plant by laying three hundred feet of track. 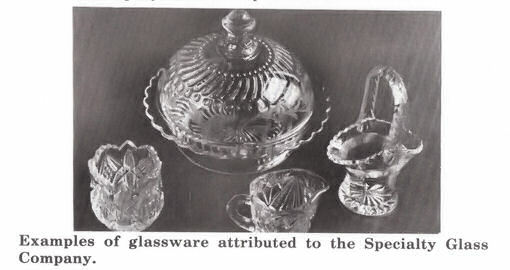 It was announced in June that the plant would be called The Liverpool Glass Manufacturing Company, Limited and would produce a full line of pressed, blown, cut, and engraved glass tableware. It was also stated that the facility would be a first rate glass factory with a fourteen pot furnace and provisions for its own mold shop. Power would be provided by a forty horsepower steam engine and the company would employ two hundred men and boys. The company began production in September and employed two shifts a day. Within four months the firm ran into financial difficulties and in September 1883 a court order to sell the plant was issued. Several years later, after a change of ownership and management, the factory reopened. Unfortunately the company again ran into financial difficulties and periodic shutdowns kept the plant closed most of the time. It was not until March 1888 that the plant entered a period of prosperity. 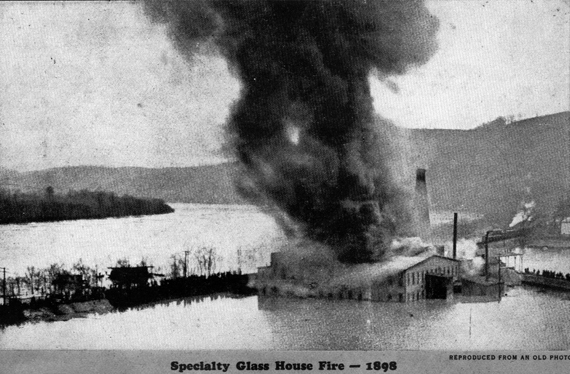 The Masonic Bank of Pittsburgh, which owned the facility, began operating the plant under the name of the Specialty Glass Company. The plant was put in working condition and by the first week of April glass was being produced. It was reported on April 12 that the company was running successfully. The company continued to operate successfully for the next decade. By 1894 it employed one hundred and fifteen males, five females, and thirty-five children. But the company still experienced difficulties. Throughout the decade, it was frequently forced to suspend operations because the Ohio valley Gas Company could not provide an adequate supply of gas. The company also fought an ongoing battle with city council over the extension of a road from the city streets to the glass plant. The city council, which was dominated by pottery manufacturers, was reluctant to assist the glass company because of the ill will between the two industries. The pottery manufacturers accused the glass company of drawing labor away from the pottery industry and of driving up the cost of labor. Animosity toward the glass company was increased when it hired unemployed pottery workers during the nine month lockout of union sympathizers by the manufacturers in 1882. The request for a proper access road between the plant and the city streets met with a cool response from the city council. In 1889 Moses E. Golding offered to deed the land for a road to the city. The city council accepted the offer, but the road was never constructcd. As late as January 1897, the company announced its intentions to leave the city because of the lack of cooperation from the city council regarding the road and because of the gas shortages. Within the next year the company had considered several offers from other cities that needed, or wanted, the business. The factory burned literally to the water's edge. Building and contents were very combustible, and everything save one or two walls and the tall furnace - which is yet intact - were licked up by the flames. 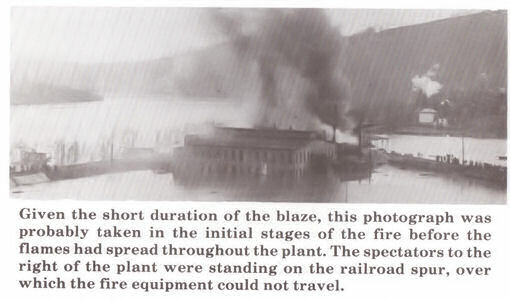 The scene was grand while the blaze was at its height. All around was a great lake of water, into which the leaping angry flames were reflected. And through all the crowd stood helpless along a railroad track and on the shore beyond the ball park, watching the destruction of one of Liverpool's great industries. The cause of the fire was never determined. One theory was that the fire was the result of an explosion of nitrate of soda in the mixing department. Another theory was that the fire was caused by a gas explosion. The company's loss was very conservatively estimated at $30,000. Un-fortunately, the plant and stock were insured for only $18,500. On August 22, 1898 it was announced that the stockholders had voted to settle the affairs of the company and that the plant would not be rebuilt.